Sit back and relax – but not too far – on the Precor 846i-R Recumbent Bicycle. Like all great recumbent cycles, the 846i takes the stress off of your knees and back, while enabling an effective and intense lower body workout. Sit back and relax – but not too far – on the Precor 846i-R Recumbent Bicycle. Like all great recumbent cycles, the 846i takes the stress off of your knees and back, while enabling an effective and intense lower body workout. But, unlike other available models, you get the same superior quality of the more famous Precor elliptical machines. The 846i employs a belt-drive system, providing a quieter, more maintenance-free experience, and with its magnetic, no-contact generator, you get none of the roughness and wear-and-tear associated with mechanical recumbents. 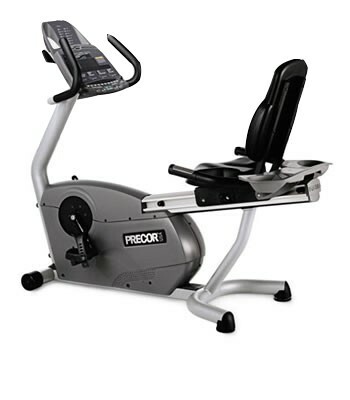 In November 2009 World Gym named Precor their premier fitness provider, and it’s not hard to see why, with the unique style built right into the 846i. 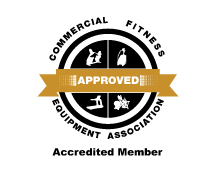 On the Certified Pre-Owned Precor 846i Recumbent bike you’ll enjoy the latest in fitness entertainment systems – including a fully-integrated Cardio Theater® 12” TV-screen – with up to 15 challenging workout programs to choose from. Climb mountains or just go at your own pace with the “Manual” setting, and since the 846i is self-powered with a no-contact generator system, the 846i can be placed anywhere in your gym or at home – no need for messy electrical cords. The “heads-up” workout display on the 846i-R is unmatched for its ease of usability and detailed feedback on how you’re doing. Just a tap on the large buttons of the display will tell you your heart-rate, your speed, your elapsed time, or just about anything else you might need to know (well, maybe not the score of the Colts – Patriots game). Most of all, the 846i delivers a fluid, natural feel – ideal for beginners and experts alike. It’s an intuitive machine that invites you to “climb-on-board”, so there’s no dread facing yet another “killer” workout.